A well attended and genuinely moving memorial service was held today outside the front doors of Paralympic sponsor Atos to coincide with the opening day of the London Paralympic Games. Atos carry out the Government’s Work Capability Assessment, a crude computer health test designed to strip disabled people of benefits by declaring them ‘fit for work’. Disabled people and those with serious health conditions have been subject to endless grueling assessments by the company and an increasing number of people have tragically taken their own lives as a result of the process. Many others have had conditions worsened due to the stress of testing regime whilst a recent investigation found that 32 people a week die after being found ‘fit for work by the company’. Around 100 disabled people and supporters gathered outside Atos’ gleaming London Headquarters to attend the service. A coffin, resplendent with white lilies to remember the dead, was carried to the front door of the company alongside funereal music. Messages sent from disabled people around the UK were released attached to black balloons whilst a minutes silence was held during which even the heavy security presence guarding the company appeared to respect. The day was part of a week of action against the company which has seen protests outside Atos offices around the UK. Visit the DPAC website for reports of other events held so far. Campaigners will be back at Atos HQ on Friday when Disabled People Against Cuts team up with UK Uncut for the Closing Atos Ceremony. Gather at Triton Square, Euston from 12.45pm on Friday 31st August. “Based on the results of a trial during 2011, we have not implemented universal recording for claimants going through the work capability assessment (WCA). We have asked Atos Healthcare to accommodate requests for audio recording, where a claimant makes a request in advance of their assessment. This approach began in late 2011 and we will monitor take up during 2012 before making a decision on the requirement for recording assessments, taking into account factors such as value for money and the value it adds to the WCA process. As part of this process we are also reviewing Atos capacity to provide recordings for those claimants who currently request one”. We at Disabled People against Cuts (DPAC), Black Triangle and Social Welfare Union (SWU) want to make sure that we gather the REAL facts on what people are experiencing. We suspect that the government will try to pull the option for recordings of WCA completely due to what they will say is a lack of demand, so we have put together a short survey to gather information on the demand for recordings and on other issues on the WCA. Have you noticed changes to the WCA process as a result of the Year 1 recommendations? If so, what are these changes? The process has got worse since the changes in March 2011 to the LiMA questions and changes to the point scoring system which the Harrington committee decided could go ahead. Would you consider a person who became spontaneously unconscious once every five weeks fit for work? Would you employ them? Would you consider them fraudulent if they claimed that this condition was disabling? In the March 2011 version of training guidelines for the Atos Work Capability Assessment two of these options are valid. The Work Capability Assessment would rate such a person as fit for work and as a result a person who is neither sick or disabled[i]. The coalition stated that the new questions were expected to add a further 5% to the ‘fit for work’ figures (stated in Independent Parliamentary inquiry into Atos and WCA by Anne Begg). No effort appears to have been made to address the 20% of inaccessible venues for carrying out the WCA. Is this a tactic of Atos to cut incomes of disabled people for not turning up? As Benefits and Work web states:In addition, out of all 141 Atos centres, only around 50 have dedicated parking on site and just one centre –Wrexham – is listed as having disabled parking. And even then it’s only one single space. Other centres rely on public car parks, which may be five or ten minutes walk away. 31 of Atos’ medical examination centres are not even on the ground floor, with Chesterfield actually perched on the 5th floor. 16 centres have no chairs with arms, vital where claimants have problems with rising from sitting. Others are listed as having just a single chair with arms. Twenty seven centres do not even supply drinking water for claimants, who may be kept waiting a very long time for their assessment. Very worryingly, in spite of the many thousands of claimants with continence problems, no details of whether the centres have toilets – let alone disabled toilets – are given[ii]. A Yorkshire bureau saw a woman in her forties who was working full-time and was enthusiastically looking forward to starting a new job, when she became ill. At first it was thought she had a viral illness, but she was subsequently diagnosed with lupus erythematosus and transverse myelitis. She was in a great deal of pain in her muscles and joints and had extreme fatigue. At times her balance was affected and she could not walk without someone to support her. Sometimes she lost sensation in her legs, and on her worst days she could not walk at all. Any exertion such as walking 40 or 50 metres led to days in bed. She had had a bad reaction to some of the treatment and an ECG showed her heart muscle had been damaged. Her husband had to come home from work each lunchtime to help her. Her immune system was weakened, so she had to be careful when mixing with others. She claimed ESA but was given six points in the Work Capability Assessment (WCA) and found capable of work. Her doctor supported her claim and she is currently appealing, but under Incapacity Benefit she would probably have been exempt and would have avoided this process. Are there further areas of work that you think should be added to the programme of work for Year 3? If so, what should these consider? The process of assessment, rejection, appeal, overturning of Atos decision, and notice of reassessment, often within 6 months, is a continuous psychological assault on those with existing health issues and their families. Despite government rhetoric, these are people who have low income and resources, and are less likely to have savings –this process can see people without funds for long periods, possible removal of income (as raised in the parliamentary inquiry) added to other factors, such as the negative almost hate proper gander distributed by the media on disabled people through the release of misleading statistics by the DWP, and an increase in hate crimes against disabled people. One outcome is an increasing number of recorded suicides by disabled people. A MAN who was worried about benefit cuts killed himself while he was searching for a job on the south coast, an inquest heard. Paul Willcoxson, 33, was found hanging in Pignals Enclosure, near Hollands Wood campsite, Lyndhurst, by walkers on April 14. The 33-year-old from Corby, Northants, was in the area searching for a summer job when he killed himself. A suicide letter and next of kin note were found in which he expressed concerns about Government cuts, Southampton Coroner’s Court heard. Deputy Southampton coroner Gordon Denson recorded a verdict of suicide. Paul Reekie, who, along with Irvine Welsh, was part of a wave of young Scottish authors who rose to international prominence in the 1990s, killed himself in his Edinburgh home last month. Friends of the acclaimed Scottish writer have accused the new government’s crackdown on welfare benefits of being a factor in his suicide. The Leith-based writer and poet, who was 48, left no suicide note but friends say letters informing him that his welfare benefits were to be halted were found close to his body. One was notifying him that his incapacity benefit had been stopped, the other that his housing benefit had been stopped. A WOMAN found dead in a drain had been worried about attending a medical appointment to assess disability benefits, an inquest heard. The body of Elaine Christian, 57, was found in Holderness Drain by a mother returning from a school run. A post mortem revealed she had died from drowning, despite having more than ten self-inflicted cuts on her wrists. The inquest in Hull was told Mrs Christian had been worrying about a meeting she was due to have to discuss her entitlement to disability benefits. Her spiraling health problems meant she had to give up her job at Cooplands bakery in Greenwich Avenue, where she was described as a cheerful, hardworking and trusted staff member. Her husband Robert’s model shop business in Holderness Road, east Hull, had recently collapsed, plunging the couple into financial difficulties. As a result, the couple was being forced to sell Mrs Christian’s childhood home in Staveley Road, Bilton Grange. He discovered a suicide note, empty packets of painkillers and pools of blood. The recent mail out of memos to Job Centre Plus staff telling them how to deal with threatened suicides through benefit cuts provides evidence that this issue is known about, yet nothing is being done to ease the stress of these actions. DPAC does not count a memo to Job centre staff as a humane action from this government or from the DWP. Rather it is evidence that the devastation that these reassessments and the misery they cause is known and treated with a callous disregard. Attempted suicide by ex-school caretaker who had brain tumour and was unable to sleep, had weakness down one side of his body and was having fits. His GP deemed him unfit to work but the 15 minute Atos medical declared him fit for work, leading to his income being cut by over £60 per week. There are also increasing examples of disabled people and those with long term health problems going for days without food or heat because they do have any money while in this process. In a wealthy country no individual should be put in this position. The reassessment every six months needs to be reviewed and changed; people are more likely to get worse than improve: this is an element of long term health problems and much impairment. Therefore this regime is illogical and inhumane. It serves to promote a regime of terror the implications of which will be more suicides and stress to those already living with long term health issues in poverty. Recently the CarerWatch forum was closed down by Atos because of a post that Atos objected to. The owners of CarerWatch were not contacted, nor told what the offending post was. Atos went directly to the web host who closed down the forum. The forum is used as an online support for disabled people and their carers to discuss issues relating to the WCA to share concerns and stories of experiences. Its sudden closure left many in distress as a vital support mechanism had been removed. There was no discussion nor any communication before this action was taken. The forum has since been reinstated. Two other web sites have been threatened with legal action by Atos that we know of. If these heavy handed tactics towards support mechanisms and sites where people share their experiences and critiques of undergoing the WCA are to be attacked by Atos in this way, then where is the space for free speech? A Company paid with tax payers’ money and employed by the DWP should not be acting in this outrageous manner. Targeting those groups who are offering support to disabled people, those with long term health issues, their families and their carers is clearly a breach of free speech and free expression: something that presumably is still on existence hence this response on the effects of the WCA carried out by the company Atos . The fact that the targeted groups were not paid by a government department to ask people their experiences with the WCA, as the Harrington committee are, appears to be the only difference between the tactics of Atos towards them and potential acceptance towards the Harrington committee critiques. If DPAC puts a copy of this response on its web site is it also likely to be closed down by Atos lawyers? On past Atos actions it would appear to be a high risk-this is an unacceptable situation. I had to give up work because my employer could not accommodate me as a wheelchair user, I would find the disabled parking bays at work taken by able bodied people, the wheelchair access into the building became designated as the main access to everyone and for several months the electronic door opener was switched off and I could no longer get into the building without asking for another persons help, the disabled toilet was often occupied by people who went in there for various reasons including: being to lazy to walk to the men’s toilets, needing to blow their nose, talk to a girlfriend on the phone, change into motorcycle gear, the list goes on. In term of the actual work it was a call centre and I did both call work and email support. I would find my phone log ins randomly changed, I would lose email access and my computer system would be up and down. The coffee machine I used was moved to 5 minutes wheeling away to the other end of the building. Access To Work had given the company I worked for over £10 000 to install electronic door openers to the internal doors so i could get around the building but other people turned them off by way of a switch on the top of the door. they did this because they did not like the doors being a bit heavier for them to push. This list goes on too. The stress, the feeling of worthlessness and humiliation, together with the physical distress meant I had to leave. I did bring a grievance which was settled (poorly) but the whole process nearly killed me and I went to counselling to sort my head out. My ability to work was always very limited but even that has not returned and so I went the ESA route. More humiliation and feeling like crap because its all about trying to tell them what I can’t do and why. When I went to the medical the fact there was a two way mirror in the waiting room so they could watch you waiting was a bit freaky. I was given ESA only of the lucky 5% (est) and put in the work related group. More worry about what was going to happen, but it went okay 6 interviews at the Job Centre over about 7 months and then I was told that is it until 2013 phew. Then the budget comes and I realise I might lose out later when I am reassessed for DLA. Lose out because the assessment process of being seen by a doc for a brief amount of time tells them little about me except yes I can just about pick up a coin. I was upset about it but then said to myself okay think about it you have over two years before anything else is going to happen. I tried to settle in to my life with my partner who has bipolar and barely hanging onto his job, which means my small income from ESA and DLA goes towards our mortgage. My sister also pays a third of the mortgage because she loves me enough to do so and she and I (when I was working) managed to keep the house by getting a joint mortgage. Last year after a three year wait a very large disabled facilities grant was finally sorted and the building work was done. No more using a commode and not getting washed properly because they put in wider doorways downstairs, made all the floors level, no more steps and put in a shower room toilet. There is even a wheelchair ramp into the garden I felt so lucky but also broken because all that work meant I was not getting better. I would never be able to walk my dog in the local woods – pathetic a want I know. I worked for what I have, with my effort, my sister, my partner and a wonderful Occupational Therapist I finally had some breathing space and my life was set for at least two years. Now comes the news of the cuts, I will probably lose my contribution based ESA which has propped up my partner’s earnings which are often less than £700 a month because of sickness. My income form DLA has a big question mark over it. Since getting on ESA I tried to find voluntary work that would keep me in the habit of ‘working’ but no one around here wants someone as physically limited as I am, so what hope of finding a few hours of actual work. My sister will continue to pay a third of the mortgage as long as she has a job, but she can’t do more and I would not expect it either. This house is not just home it is a disabled access and adapted home, but if my loss of ESA results in arrears to the mortgage and we will lose the house. If we lose the house there will be other consequences because we are expected to pay part of the housing grant back if the house is ‘sold’ within ten years. I will never be able to get the life I have now Back once it is gone. It took 7 long years to achieve after I left my family moved away to be alive and not just live. I already said it’s like a wrecking ball is posed to smash everything to bits and even in all this I will be one of the lucky ones because I already know there are a lot of disabled people who are worse off than me. I’m on income based JSA and have been on it for about 18 months now. I’m on Flexible New Deal because of how long I’ve been unemployed, and I’m on stage 4 (I think, people just keep spouting numbers at me) which means I get shopped off to an ‘external provider’. The first one was Remploy, who would have required an act of god to improve to ‘appalling’. The new lot call themselves ‘International Learning Centre’. They called, made an appointment. I asked for level access, and after a startled pause and being put on hold, they said ‘fine’. When I got there, I waited 30 minutes after my appointment time in a dreadful chair, before being asked to follow someone upstairs with the rest of the twenty people who’d been crammed into a room about two metres on a side. Ended up, as usual, at the back of the crowd, was annoyed heading for angry by now so as everyone disappeared I went into the office and reminded them that I needed and they had agreed to provide level access. got told to keep waiting. after another 20 minutes or so, when i was now in excruciating pain because of the stupid chair, someone came to ask me through into the office, where I was perched in an equally stupid chair on the end of someone’s desk, next to the printer, where people kept squeezing past me. this appears to be how they propose to deal with my inability to climb the stairs. oh, and by asking every ten minutes or so if I’m *sure* I can’t ‘just’ climb the stairs?! the disabled toilet (yes, they have one, I have no real idea why given that every bit of the building they use for clients – and that the staff have to therefore be able to access – is upstairs) has a keypad lock on the door, so if I need the facilities while I’m there, I have to find someone to ask permission of, they have to find someone who has the code, someone has to come and unlock it and hope that by then there’s not a puddle on the floor. Undignified at the least. I’ve been told that they can’t provide me with facilities to do my jobsearch – I’m expected to find those for myself. Despite developing speech problems, I can only contact them by phone. If my ‘advisor decides [I] require’ training then this will be given downstairs – presumably, in the middle of the office. I’ve been made to describe my medical condition in the middle of the office, where such comments are being made as ‘God, this lot stink’ ‘Have you seen the state? No wonder they’ve not got jobs!’ and similar. Oh, and apparently I have to undertake four weeks’ Mandatory Work Related Activity. What they seem to mean by this is that for my current £65.45/week, I will be expected, for four weeks, to work for 30 hours per week. On telling them I couldn’t do this due to the state of my health, I got told that my jobseeker’s agreement states I can do 40 hours a week, and states ‘no health conditions’. I explained that’s not correct, that I’d asked for it to be changed and the jobcentre staff had refused. Eventually, I got told I’d need to see a Disability Employment Advisor, that I had the right to see one, and that they and only they could revise my jobseeker’s agreement because of my health. ‘Just phone and make an appointment’, she said. Well, I tried. I have speech problems, I only have a mobile and the Jobcentre are now on a central 0845 number where they ‘transfer’ you to your local one. It took me a while before I thought I’d made myself understood, and then I found out I’d been transferred to my local jobcentre, all right – to the Lone Parents Team. I am not, and have never been, a parent, lone or otherwise. They told me that the DEA would want ‘details of my disability’ before they’d book an appointment to see me, and she asked for them as well. I suspect they want proof, in the form of diagnosis, which I don’t have. The DEA cannot contact me other than by phone. I cannot contact them directly, by phone or otherwise. There’s no way to know whether they *will* bother to contact me, or when. And without it, I will be forced to work *minimum* 30 hours/week for four weeks. Despite the fact that it will nearly bloody kill me. Despite the fact that none of the places they’ve proposed to put me are physically suitable, and when I pointed this out I got told to find somewhere myself. I’ve no idea what it is I’m actually supposed to be looking for. And if it doesn’t all come out right, it’s apparently my fault and I will lose my money. So.. no access. No dignity. No understanding. Constant misinformation and lies and demands that I do the impossible. And when it screws up, it’s my fault and I’ll suffer for it. At what stage should we stop making changes to the system and let the changes already being made bed in to ensure they are having the desired impact? ‘Theoretically perfect’ is an erroneous term-this process needs to be efficient in achieving the claimed aim of whether people are ‘fit for work’ in practice. At present it does not achieve this. A perfectly good system has been in operation for years through GPs, specialist doctors and consultants. It achieved its aim of whether people were ‘fit for work’. Recently a lady had to give her business, and make employees redundant because of a miscommunication by the DWP, she managed to get advice fast enough to rectify part of the situation, but too late to save the business she had worked to build up over a number of years and too late to save peoples’ jobs. This is another example of the changes that the coalition is making which is achieving the opposite of what they claim they want to achieve. ‘Theoretically perfect’ wouldn’t have saved those peoples’ livelihoods. Does the Year 1 recommendation go far enough in placing the right emphasis on the face-to-face assessment? Do you have any robust evidence about the face-to-face assessment processes and outcomes which will help us make recommendations for future improvements? The large number of those winning appeals to overturn Atos’ decisions should be counted as ‘robust evidence’. The only substantial improvement to this assessment process would be to scrap it: use the money saved on payments to Atos Orgin and on appeals to reinstate the Independent Living Fund and invest in disabled people , those with long term health issues rather than to reduce their incomes so that many are left without the means to get to work even if jobs were available. Are you aware of any concerns about the face-to-face assessment, and if so where have these been focused? DPAC has a great deal of evidence saying that HCP’s approach and the way they carry out assessments is beyond flawed. The recent cases against 12 Atos HCP’s and the two public comments about disabled people on Facebook give some idea of the potential loathing HCP’s can develop for disabled people and those with long term health conditions. The approach of the HCP’s is often described as cold and dismissive, one person described their assessment as a like a trial in which they were judged as guilty (i.e lying about their health condition and its debilitating effects) before evidence was given. Many HCP’s do not appear to have any knowledge of health conditions, long term illness or impairment, however this is hardly surprising when Atos employs physiotherapists and junior nurses amongst their ranks of HCP’s. The continuing rise in successful appeals against Atos decisions, based on reports by HCP’s via the all powerful LiMA system of closed questions suggests that neither the IT system nor the reporting process is particularly efficient. Taken as a whole these factors would point any logical person to the conclusion that the process is severely damaged and so beyond improvement. It needs to be scrapped. If you have heard specific concerns about the IT supporting the assessment (i.e the Logic Integrated Medical Assessment or LiMA system), do you have any robust evidence about how this adversely affects the assessment or its outcome? The LiMA system is severely limited in assessing health conditions on a day-to-day basis, it offers questions that have no relevance to everyday situations or situations in the workplace, it relies on functioning aids which break or wear out as a proxy for mobility and other impairment ‘eradication’, a computer cannot judge fluctuating conditions nor the complexity of long term illness, terminal illness , impairment, multiple impairment or the impact of disabling barriers-these factors alone adversely affect assessment outcomes producing an unrealistic and totally unreliable point scoring system in which the computer says no and 70% of cases at tribunal say yes in that they overturn decisions made by Atos operatives. The 70% success rate at appeal should be evidence enough that the assessment outcomes are severely flawed. Is there a need to present and explain the face-to-face assessment in a different way, making it very clear to claimants what it will involve and how a functional assessment relates to work capability? These questions like those previously give few options, this one in particular has the epistemological starting point that the face-to-face assessment is working. It is not. Forty percent of decisions being overturned and 70% of those upheld on appeal with representation. This does more than suggest that face-to-face assessment is not working almost half of the time. It states it as a fact. It is also a peculiar term as face-to-face does not appear to happen, rather the HCP is positioned face-to-face with a computer screen. What one thing would you change about the WCA to make it operate more fairly and effectively? Take General Practitioners, consultants and other medical expertise into account from experts who know and understand the person concerned day-to-day issues, health problems and support needs. There are a whole range of health conditions, impairments, and long-term illness’ the complexity of which cannot be judged by a computer operated by a HCP who is a physiotherapist, nurse, doctor that calls people they are supposed to have a duty of care towards: ‘customers’ because their company have insisted on it as a condition of employment in their 8-21 days training course as a ‘disability assessor’. It is a travesty to have a person’s life assessed by a set of closed questions which appear to ‘pass’ those who have died from their health issues a week or two later as ‘fit for work’, or pass those who later have the decision overturned at appeal. How long will it take to admit that this system does not work under its guise of assessing if ‘people are fit for work’? Maybe while the real purpose of reducing the cost of disability support and eradicating the human rights of disabled people is achieving it aims, the WCA will continue to destroy the lives of thousands of disabled people and those with long term health issues with the blessing of professors, ministers and a public that is fed distorted facts. History will judge. Great news on the ESA Amendment! at George Potter’s blog. DPAC is calling upon all members to write to the Lib Dems to build support for a motion being put forward at their annual conference on September 17th about fundamental changes to the Employment and Support Allowance assessment system. An amendment to the motion put forward by George Potter relates to the difficulties currently faced by disabled people placed in the Work Related Activity Group, many of whom have fluctuating conditions which may vary widely from day to day, who face the ongoing threat of having their benefits sanctioned if they fail to fully comply with conditions imposed on them regardless of how difficult this may be for them. Lib Dem Youth believe that the government will listen if the motion is passed. DPAC would ask its members to contact your Lib Dem MPs, MEPs, councillors and peers to urge them to vote in favour of the motion. You can find their contact details at www.parliament.uk If your MP is not a Lib Dem then please write instead to Nick Clegg, deputy prime minister and Simon Hughes, deputy leader of the Lib Dems who it is very important to influence. Please send us copies of any letters you do send and we would also like to hear what responses you receive. Atos are the French IT outsourcing company who’s Atos Healthcare arm have been running Work Capability Assessment for the Department of Work and Pensions. Lots of people are unhappy about Employment Support Allowance, about the assessments, and about the way that Atos run them. 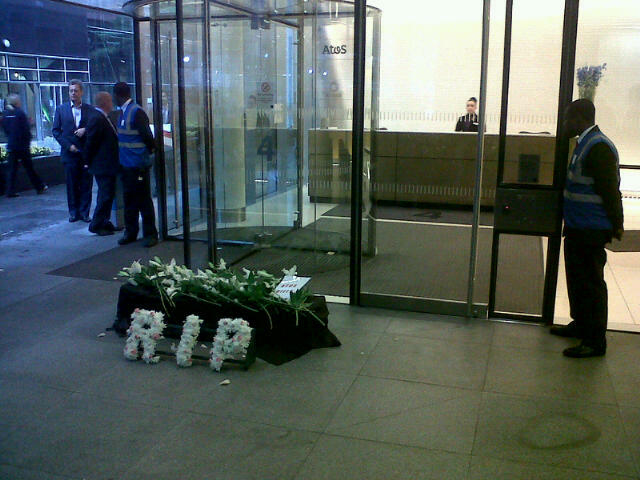 There have been protests outside Atos offices using slogans such as “ATOS kills” to express their feelings. Lots of people have explained why they are unhappy with Atos in blogs, on social networks, and in support forums. They have also shut down a support forum for carers, CarerWatch, by contacting their server host directly and having it taken down. This has removed a vital support network from many carers, presumably because of private discussions about Atos in members only parts of the forum. Apparently people are not even allowed to talk about Atos now, despite needing to do so to support each other when going through tests administered by Atos. CarerWatch is an internet forum for sick and disabled people and their unpaid family carers. This is a private forum and only members are allowed to make/read posts. We understand from the organisation that hosts our forum that they received a letter from your solicitors threatening to sue us for libel. The provider immediately closed our site down. We have many members who are very fragile and the sudden disappearance of a support group has caused a lot of distress and fear. Some are ringing us in tears. We cannot get in contact with all of them though as we have lost their contact details through the closure. All this distress could have been avoided if you had had the courtesy to contact us first and tell us what had been posted on our site that you considered libellous. Obviously if any post was possibly libellous we would have removed it and all this distress could have been avoided. We imagine this distress is unintended and hope you will work with us in looking at the problem and finding a solution. Please note that this letter, and any reply received from yourselves, will be posted on our website. It is the only means left to us to reach some members and keep them updated. It is vital we have our forum up and running again to reach those that are isolated. Obviously, I don’t want my website taken down. I have been careful to state only known facts here. These are the facts that I know. Atos Healthcare carries out Work Capability Assessments for the DWP. The contract is worth approximately £100 million per year. 40% of those that appeal, win, rising to 70% with legal representation. Although the decision over “fit to work” lies with the DWP,a government review found that the DWP are institutionally incapable of overriding the Atos Health Care Professionals. The Atos recommendation is, in effect, the decision. Atos employ Health Care Professionals to carry out the assessments. HCPs are a mix of doctors, physiotherapists and nurses. Only people with certain problems will definitely see doctors. Atos use their own Lima computer system to record the patient’s answers. Lima has been widely criticised. The HCP fills in Lima by choosing keywords and statements from a list and then justifying them. Twelve Atos doctors are under investigation by the GMC over allegations of improper conduct. Two Atos employees are under investigation after referring to patients as “parasites” and “down and outs”. In the end, although there is much to criticise with the way that Atos carry out ESA WCAs, they may really only be doing what the government expects of them. The descriptors that are used to make the decision of whether a person is fit for work or not are set out in the by the government. (See The Employment and Support Allowance (Limited Capability for Work and Limited Capability for Work-Related Activity) (Amendment) Regulations 2011) I personally question whether Atos accurately records if a patient fits the descriptors or not, and their ability to do so given the way that Lima Works or the staff that are used. Even if they do make an accurate record in line with the government’s descriptors, it is questionable whether the descriptors are an accurate description of being fit for work or not. Even then, it seems that decision makers at the DWP are “institutionally incapable” of taking into account all of the relevant information for the case as they are supposed to, instead simply rubber stamping the recommendation made by Atos. It would seem that the appeals tribunals are making a fairer judgement on this issue than Atos or the DWP. Cross posted from Tentacles of Doom. DPAC condemns the outrageous comments made by Phillip Davies Conservative MP for Shipley, Yorkshire. Davies announced that disabled people should be paid less than minimum wage. He claimed disabled people are considered less productive than non disabled people. Davies was condemned by Disability organizations, MPs and others for his thoughtless comments. His comments come at a time of rising unemployment, a time when disabled people through the Work Capability Assessment are being moved from Incapacity Benefit to being declared ‘fit for work’ by the maligned Atos group. Atos has already been subject to several investigations on its practices. Davies who has made previous comments suggesting disabled people are ‘scroungers’ now claims that disabled people should be paid less than £5.93 per hour. From scroungers to slave labour! For years disabled people have argued that employers’ attitudes that perceive disabled people as less productive, regardless of qualification level or previous experience are issues that need tackling through education. The recent changes to Access to Work and the increased levels in the contributions from employers for adjustments have also had a knock-on effect on disabled people getting work. Disabled people are those most likely to be long-term unemployed NOT due to impairment but to ignorance of the very kind an elected MP feels no qualms about displaying. Even our enemy media outlet the Daily Mail condemns Davies. Davies’ comments set disabled peoples’ opportunities back 20 years. It is the type of prejudice that we would expect from MPs given the raft of misunderstandings around disability that we have endured since the coalition came to power. The irony is that disabled people regardless of qualification are often paid less than their non-disabled colleagues. This is not because of productivity but because employers feel they can get away with it. In 2009 disabled people were paid a gross average of £11.08 compared to £12.30 for non disabled employees (Labour Force Survey 2009). DPAC suspects the differences are wider. These are the issues MPs should be discussing NOT reducing disabled workers wages further. Davies fails to recognise that disabled people have the right to be paid a living wage, a fair wage, and a wage appropriate to skills and qualifications – and it seems all MPs fail to recognise the UN Convention on the Rights of Persons with Disabilities– a convention setting up disabled peoples’ rights as equal to those of non-disabled people. No one should be considered a second class citizen because they happen to be disabled, nor should they be paid less for the same work. Debbie Jolly: The Billion Pound Welfare Reform Fraud: fit for work? Would you consider a person who became spontaneously unconscious once every five weeks fit for work? Would you employ them? Would you consider them fraudulent if they claimed that this condition was disabling? In the March 2011 version of training guidelines for the Atos Work Capability Assessment two of these options are valid. The Work Capability Assessment would rate such a person as fit for work and as a result a person who is neither sick or disabled. The Work Capability Assessment is carried out for those migrating from Incapacity Benefit and for new claimants to Employment Support Allowance (ESA). It was put in place by New Labour in 2008. It is administered by the French/Dutch Company Atos at a cost of 300 million. Those going through the test can be put into one of three groups. ESA Work Related Activity Group, for those deemed fit for work with support and preparation. Limited to just 12 months before ESA is stopped, also may be subject to reassessment in the 12 month period. Since its preliminary rollout in 2008, people with terminal cancer have been found fit to work, people with mental health problems have complained their condition is not taken seriously, people with complex illnesses report that the tick-box system is not able to cope with the nuances of their problems. Between October 2010 and Spring 2014 those who receive Incapacity Benefit, Severe Disablement Allowance and Income Support paid on the grounds of illness or disability will be assessed for Employment and Support Allowance. Pilots in Aberdeen and Burnley have raised more criticisms of the process adding to the raft of criticisms from the British Medical Association, the originator of the software that Atos uses, GPs, Citizens Advice Bureaus (CABs), Members of Parliament and disability organisations. The Work Capability Assessment replaced the Personal Capability Assessment. Yet, as long ago as 2006 the Green Paper: A New Deal for Welfare: Empowering People to Work, stated ‘the current Personal Capability Assessment process (is) already recognised by the OECD as being one of the toughest in the world’. The WCA does not take into account GP assessments of an individual’s impairment or long term condition, this is ignored in favour of an, or average, 15-45 minute set of questions administered through the LiMAS software developed by Atos. LiMAS asks a set of questions for which the applicant can, but increasingly can’t, score up to 15 points which would put them in the ESA support group. As GPs who may have known applicants for all of their lives with an understanding of the medical, social and emotional impacts are ignored, a new set of individuals come into play called ‘health care professionals’. These individuals are trained by Atos for four to 16 weeks to understand targets and the all powerful LiMAS software; they are given time limits for each assessment and told that the more people they get through the better. They consist of physiotherapists, nurses and doctors usually with a general practice background or from overseas due to the notorious low pay of the multi- million pound profit Company Atos. There is strong evidence that the system can be impersonal and mechanistic, that the process lacks transparency and that a lack of communication between the various parties involved contributes to poor decision making and a high rate of appeals.” and that “evidence has consistently and regularly highlighted problems with each stage of the WCA process, which limit both the assessment’s fairness and effectiveness. In a government report, Atos’s own staff said the assessments are too harsh. Prospect, the trade union who represents 135 Atos doctors, has stated that the target of seeing ten or more people a day is unrealistic and will lead to wrong assessments, especially in complex cases. Despite the overwhelming evidence that WCA was not working Atos were awarded a further contract by the Department of Work and Pensions in 2010. The figures of those considered ‘fit for work’ by Atos testing systems regularly make headlines in newspapers such as the Daily Mail, the Express, and most recently the Guardian, but little investigative journalism has been exercised in examining this apparent miracle of ‘curing of the sick and ‘the disabled’, nor looking at process, outcomes or the ways that these figures are produced. For example, newspapers do not tell us that there has been a 56% increase in ESA appeals with figures up from 25,700 in the second quarter of 2009/2010 to 52,000 in the same quarter of 2010/2011. Almost half of cases are overturned at appeal.Nor are we told that figures from the Department for Work and Pensions show that of those declared ‘fit for work’ by the WCA system, just 13% are in employment, 27% temporarily sick and 28% classed as permanently sick. The ‘fit for work’ myth does not convert into any form of reality. Nor is the context of the claims ever provided, a representative survey carried out by Ipsos MORI and reported in Employment and Support Allowance: findings from a face to face Survey commissioned by the Department of Work Pensions found that nearly a third of those going through the ESA process were described as having ‘literacy problems’. A further six per cent ‘problems speaking English’ and 11% had ‘numeracy problems’. Twenty two percent were described as in one or more disadvantaged groups including those with mental health issues, ex-offenders, and those with perceived learning difficulties. An overwhelming 69% of those going through the WCA process had ‘multiple health conditions’. Those in the support group and in the ‘fit for work’ group both had the same number of ‘health conditions’ at 31. In all groups 81% of people were receiving medical treatment for their condition, with 38% waiting for treatment or additional treatment  These statistics do not present us with a set of fraudsters pretending to be sick or disabled, nor a set of individuals who have been languishing on incapacity benefits for years, in fact 71% of applicants to ESA were new claimants making their first ever claim. Newspaper headlines have also made much of the incomplete claims and those that ‘drop out’ of the testing system. This rhetorical demonising does not examine the process of WCA claims nor take into account the medical treatment. The first form that individuals will receive from Atos is an ESA50 form, of those surveyed almost half 46% said they found the form ‘difficult’ or that they were ‘unable to complete it’. An initial point for non-completion, others could be knocked off the system if Job Centre Plus decide that they have missed an appointment, or not responded to a letter without ‘good reason’. This would seem to complement the new punitive sanctions for universal credit and welfare reform first expressed in the Welfare Reform Bill. The costs of tribunals, Atos contracts and the extra strain on the health service amount to a million pound fraud by successive governments. This does not count the human anxiety, misery or stress of the test, nor the suicides that have resulted because of it. Remarkably, Chris Grayling minister for employment (note minister for employment, not health or disability) said the government was making “almost constant improvements” to the WCA, but that he was “always willing to talk to the charities”, not disability organisations run and controlled by disabled then. He said “if we do something that does not prove to be the right thing, we will be happy to change it”. The new set of training guidelines proves that changes have been made. However, these changes make the WCA more not less stringent, maybe the percentages of those declared ‘fit for work’ did not satisfy the existing regime. This handbook has been written to support Health Care Professionals (HCPs) trained in the principles of Disability Analysis; in their training and in performing medical assessments in relation to the Employment and Support Allowance Limited Capability for Work / Limited Capability for Work Related Activity (LCW/LCWRA) Amendment Regulations 2011. The amendment regulations of 2011 may also be referred to as “The Revised Work Capability Assessment” (Revised WCA). Page 9 amazingly states: ‘The analysis of the data established that the WCA (ESA regulations 2008) was accurately identifying a person’s capability for work’. However, an internal review produced the following recommendations. Text below is copied from pages 9-10 outlining the recommendations. Sections in bold are my own ‘disability analysis’. In this area, it was felt that the 2008 activities did not accurately reflect the level of function required for the modern workplace. As a result “walking” has been changed to “mobilising” to reflect the functionality of wheelchair users. It was also felt that considering standing and sitting abilities as separate entities was not relevant in the modern workplace and the new activity relates to the ability to remain at a workstation. In the 2008 descriptors, bending and kneeling were considered, however the ability to bend or kneel are no longer considered critical in the modern workplace, so this activity has been removed. The review group felt that unilateral upper limb restriction would not significantly impact on an individual’s ability to work and therefore all descriptors now relate to bilateral restriction. As bilateral restriction is a significant issue, the manual dexterity scores have been revised to reflect this issue. In the 2008 regulations, the activities in this area reflected impairment. Adaptation had not been taken into account in these areas. The review group felt that an individual’s ability to adapt must be taken into account and therefore the activity of vision has changed to the concept of being able to safely navigate. The activities of hearing and speech have been changed to the more functional concept of being able to receive communication and communicate with others. If you are blind, deaf, Deaf or unable to speak you are ‘fit for work’ It’s about being able to safely navigate and receive communication and communicate with others, presumably with unavailable space age communication aids. This made the assessment overly complex and thus the descriptors have been amended to reflect any loss of continence. The loss of dignity associated with incontinence has been reflected in the scoring of the descriptors. In this area, it was felt that infrequent loss of consciousness would not substantially impact on a person’s ability to work and therefore only those experiencing weekly or monthly episodes of loss of consciousness will be awarded scoring descriptors. In understanding and focus, it was felt that the 2008 descriptors were complex and difficult to interpret. These have therefore been simplified. In the area of learning tasks, how an individual learns is no longer considered to be the crucial factor – it is their ability to learn that is considered. In awareness of hazard the review group felt the important issue in the workplace was to assess the level of risk for the person and others. The activity of personal action has been amended to reflect a person’s ability to prioritise and complete tasks. In adapting to change, the highest descriptor reflects a total inability to cope with any change and is now a Support Group. In getting about, it was considered that the familiarity of a place was more important in functional terms rather than the frequency of ability to get to places. In the area of social interaction, the review group felt the previous descriptors were rather negative in their wording and the new descriptors relate to ability to engage in social contact an individual’s ability to behave in an appropriate manner with others. Neither the PCA or the WCA were ever really centred on assessing peoples’ fitness for work; they were always part of a mutual linking between successive Government’s will to cut social claims on the state, insurance companies such as the discredited UnumProvident (now renamed Unum Group) in the early days, and private companies such as Atos’ willingness to meet targets while increasing profit. The entire process is likely to cost the hallowed taxpayer more than the original benefits bill did, the cost of Atos contracts, the cost of tribunals, and the cost of addition health care caused by the misery of the WCA add to the higher long term costs. Yet, it’s all done under the guise of state efficiency and the market economy. The WCA is about exploiting aspects of the social model to develop a badly mutated individualistic ‘can do’ attitude merged with a culture of blame for ‘can’t do’ aspects of bodies and minds in an increasingly disabling welfare reformist climate. Welfare reform exemplifies the transformation of the old style nation state into a new kind of ‘enabling’ market state. Instead of providing social protection, the market state offers ‘opportunities’ and ‘choice’ to ‘customers’, who in return must shoulder a greater degree of responsibility for their individual predicament… But the compact between the state and an individual whose life has been disrupted by disability or sickness is not an equal one… The history of the British welfare system has always been one of grudging, paternalistic and sometimes punitive forms of social protection. But even measured against its own limited ambitions, the future of welfare looks bleak. Citizens Advice Scotland. The work capability assessment. 2010.www.cas.org.uk/Resources/CAS/Migrated Resources/Documents/CR Work capability assessment. Quarterly Statistics for the Tribunals Service, 2ndquarter 2010-11 Ministry of Justice and Tribunals service 13th January 2011.